Every once in a while I like to take a break from the calorie-rich, salt-infused, flavor-coated Snacktaku reviews to focus on lighter fare, if only to repress the popular notion that my entire diet consists of nothing but complete and utter crap. As much as we enjoy food dipped in melted cheese and fried in pig fat, you can only eat so much of that before you wind up weighing as much as a small car. I did not lose 90 pounds in 2012 by chasing gravy with milkshakes. Sometimes I ate Fudgsicles. 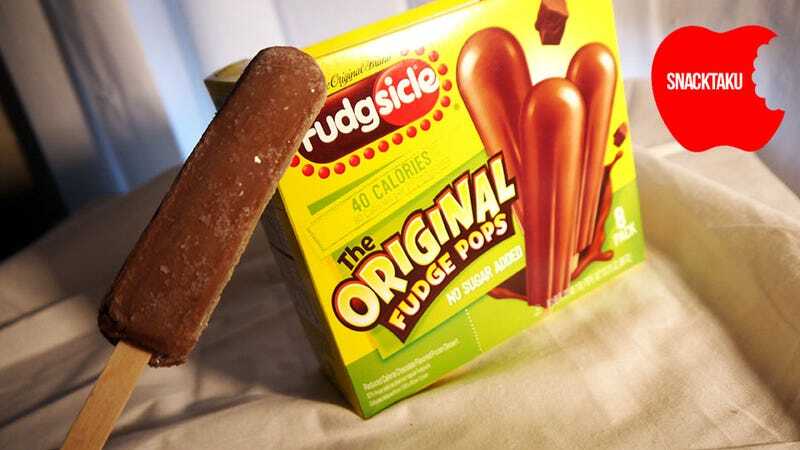 Fun fact: There is enough room in an 1800 calorie-per-day diet to eat 20 No Sugar Added Fudgsicles. Michael Fahey's record is 10. I discovered the No Sugar Added Fudgsicle while forlornly scanning the ice cream section Wal-Mart during the early days of my eating habit adjustment. As a whole, the ice cream freezer area of any store is the most depressing place a dieter can journey. It raises hopes and then dashes them at every turn. Pick up a pint of Ben and Jerry's and read the nutrition information. Oh, only 320 calories? I can handle that! Read further. Servings per container: 4 — you can imagine how horrific that realization was. So I was understandably skeptical when I saw the "40 Calories Per Pop" splashed across the front of the No Sugar Added Fudgsicles. Really, 40 calories? Do I have to slice the bar in half? Not at all, it turns out. You just need to learn to love the taste of sugar-substitute Sorbitol. Luckily, it's one of my favorites — not as beloved as Sucralose, but right up there. Sorbitol takes the place of the sugar and high fructose corn syrup of the proper Fudgsicle, mixed together with non-fat milk, alkali-processed cocoa and a bevy of flavorings and binding agents to create a super-skinny version of the original national treasure. Without exception a freshly-unwrapped No Sugar Added Fudgsicle looks like a crystal-studded alien landscape. Go ahead and expand that beauty for the full effect. That's an odd-looking frozen milk pop, a far cry from that pristine pop on the front of the box. Perhaps a warm mouth will fix it. Well that's no good. It's closer in color to the box art, certainly, but pulling in close reveals a bubble-specked surface not dissimilar to a finely-shaken bottle of Yoo-Hoo, another mildly-chocolate American tradition. I mention the chocolate drink because the taste of the No Sugar Added Fudgsicle is quite similar. It's a mild milky chocolate flavor, dancing at the edges of darkness but never quite succumbing. In this format, Sorbitol's slightly bitter bite merges with the cocoa, becoming part of the experience rather than an aftertaste. The main difference between a traditional Fudgsicle and the No Sugar Added variety is texture. The sugar and corn syrup-sweetened Fudgsicle bar has a creamy consistency. Leave one on the counter for a few minutes and it'll droop and bend when picked up. The No Sugar Added variety is more icy than creamy, transitioning from solid to liquid much more quickly. Considering how fast I eat these things, that's normally not an issue. I know that deep inside the heart of my stomach there's a voice crying out for something richer and creamier. Were that voice to combine with my desires for frozen treats and chocolate the resulting chorus would turn me into an ice cream devouring beast. Thankfully the No Sugar Added Fudgsicle satisfies two out of those three, keeping me below the danger threshold while helping me maintain my girlish figure. One final note: avoid store brand no sugar fudge pops like the plague, lest they become the instruments of humanity's downfall. They aren't very good.